A beautiful example of Gods work in the world today and a call to stand strong for your faith. China is well known for its persecution of the churchpersecution that has led to an incredible revival and tremendous church growth. By some estimates the church in China has as many as 100 million members. While many know about the painful suppression of the Chinese church, few realise just how open China is becoming to the incredible work of the Holy Spirit. In Chinas Opening Door Dennis Balcombe highlights the tremendous move of God happening right now in the country and the amazing miracles He has performed. The book also issues a challenge: those who live godly lives will suffer persecution, and we must never be ashamed of the gospel and our faith. Persecution will even come to Western believers when they stand up for the truth. Had Dennis and these Chinese house church leaders submitted to the governments regulations, they would not have gone to prison, and there would have been no persecution. But also the tens of thousands who eventually became Christians would still be in darkness. China's Opening Door by Dennis Balcombe was published by Charisma House in November 2014 and is our 17163rd best seller. 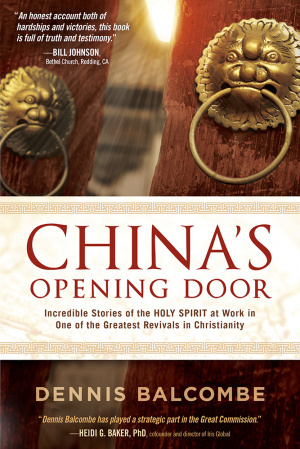 The ISBN for China's Opening Door is 9781621365723. Be the first to review China's Opening Door! Got a question? No problem! Just click here to ask us about China's Opening Door.